The CONNECT project concerns reception, protection and integration policies for unaccompanied children, with a focus on how actors work individually and together to respond to the rights of these children and fulfil EU law obligations in their regard. Through country mappings (in Italy, the Netherlands, Sweden and the United Kingdom) and the development of tools, the ultimate purpose of CONNECT is to contribute to concrete and practical measures that support actors better to address the needs and rights of these children. The mapping took place in four countries in which there is considerable experience in addressing the situation of both asylum seeking and non-asylum seeking unaccompanied children and included countries of transit and destination (Italy, the Netherlands, Sweden and the UK). It focused on the actors who have formal roles towards unaccompanied children, and how they work individually and together, to fulfil the obligations in EU law and the UN Convention on the Rights of the Child. 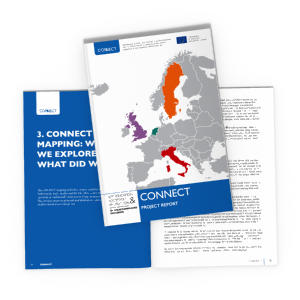 The mapping identifies existing and emerging practices that could directly inspire improvements across the EU. They also highlight common challenges to which common EU resources might be brought to bear, for example, through further regional research, trans-European projects, interpretative guidance or common training. EVERY YEAR, THOUSANDS of unaccompanied children travel to Europe in search of a new life. Reception conditions as well as access to the asylum and other protection procedures differ between countries and further progress is needed to ensure unaccompanied children’s rights are respected in EU Member States. THE COMING YEARS will be a key moment across Europe given that Member States must transpose and implement EU legal provisions concerning unaccompanied children, including within the new EU asylum and trafficking instruments. Un-der the EU Action Plan on Unaccompanied Minors (2010-2014), we are seeing the delivery of certain practical measures of support by the EU and its agencies which should support national implementation activities (e.g. on age assessment and family tracing). Moreover, the EU has also recently focused attention on how it can better support national child protection systems, including in terms of how they reach out to unaccompanied children. A WIDE RANGE OF actors and issues are involved in responding to the situation of unaccompanied children arriving in Europe. Key issues addressed by these actors include recognition as a child and access to reception services, education and health services. Other important issues are disappearances from centres, detention, restoring family links, status determination and the search for durable solutions. The CONNECT project aims to contribute to ensuring proper implementation and application of these new EU obligations, in line with the EU Charter of Fundamental Rights and the UN Convention on the Rights of the Child, by considering the roles and responsibilities of actors responding to the situation of these children and how they best work together. SAVE THE CHILDREN SWEDEN together with UNHCR’s Bureau for Europe, NIDOS (NL), Coram Children’s Legal Centre (UK), Save the Children Italy, Don Calabria (IT), the Italian Ministry of Labour and Social Policies and the County Administration in Västra Götaland (SE), have received funding from the EU for this 12 month project, ending in September 2014. The project aims to identify and promote good practices on reception and protection, focusing on the roles and responsibilities of actors engaging in the situation of these children and based on national mappings carried out in Italy, the Netherlands, Sweden and the UK. Each country have also developed practical tools which can be used by actors across the EU Member States. THE CONNECT PROJECT hosted a regional conference in Brussels in June 2014 where almost hundred partcipants from more than 20 European countries participated and four national seminars in Italy, Sweden, the Netherlands and the United Kingdom in September 2014. Good practices and recommendations have bene identified and presented in the Project Report. The project developed an EU Reference Tool which sets out the body of EU law and policy which relates to unaccompanied. The EU Reference Document should serve as an important support for policy makers and practitioners alike. The project mapped how actors work, individually and in cooperation with each other, in four countries in the EU (the Netherlands, Italy, Sweden and the UK). National reports set out the findings in each country, identifying challenges and highlighting noteworthy practices. A comparative report identifies common challenges across the four countries and national practices from one country that might inspire good practice across the region. The project developed five practical tools addressing key aspects of actors’ work together. Each tool has been developed by a national partner and the CONNECT tools aim to increase actors’ skills and stimulate cooperation between them and be used by actors in other jurisdictions. They can be used individually or in a complementary way across a number of issues, including: first encounter, reception, guidance to actors working with children, promoting child participation, and ensuring decision-making procedures better fulfil the rights of the child to be heard. The mapping and the tools both inform the targeted recommendations for action and priority areas for further work, nationally and at European level. This webpage and all publications have been produced with the financial support of the European Commission, but the contents of the site and the publications does not necessarily reflect the views of the Commission.